Now my babe is 6 weeks old I am starting to crave for my old clothes. I have been very happily going through all my clothes. Most of them I can wear again! But, many of them are not fit for breastfeeding, which I hope to be doing for a while. Since it is summer here and it is supposed to be good weather for dresses I went to look for a long nursing dress. To no avail. Breastfeeding dresses are either short or I have to wear a skirt. Or there is the option for dresses that leave too much room for a belly that I no longer have. Luckily I have a sewing machine (well, three) and an imagination. I am going to take the pattern of a short dress that I already own and make a new long dress whilst recycling some of our old garments. What I already have is a green Topshop dress. It has two layers as a top part, one you can pull aside and one more to cover that up. I am going to copy this double layer part while slightly changing the shape. Like I said, I am also going to make my new dress long! The most interesting things happen at the top! So I made a paper pattern, because I wanted to change a few tings. The armhole was far too low on the original dress and I didn’t like the shape of the neck. 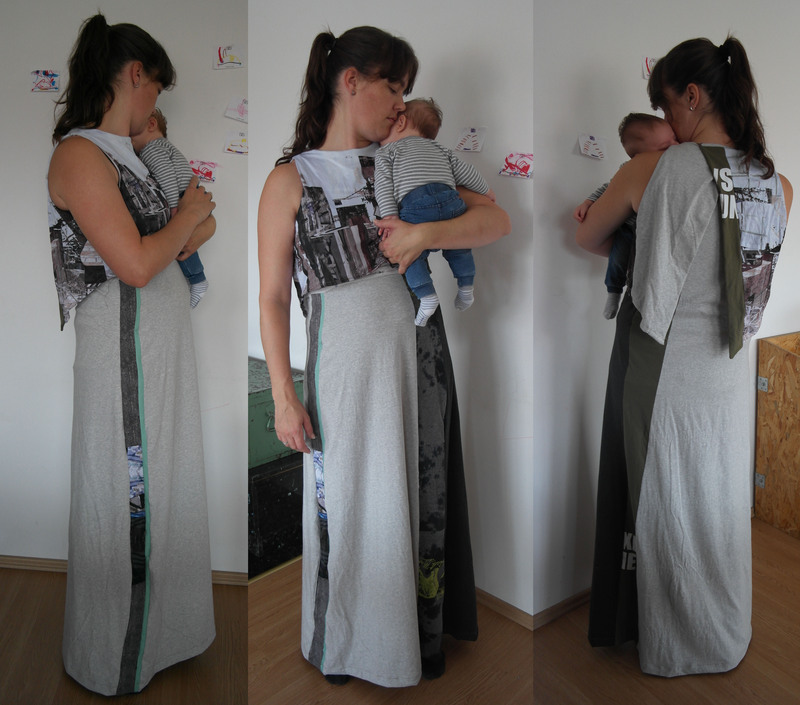 I changed the fabric layers on the back in order to create a smarter look. All the pattern pieces needed for the top of the dress. First up in the previous picture are the two overlapping layers of the front of the top with the layer that will go over them. Next is the back layer that will be cut together with the longer part so it doesn’t have a seam on the back. The last part you can see is the partly overlapping layer on the back of the dress. Apart from the pattern making I also need to select the fabrics and the upcycled pieces for this dress. A part of the process I always like! 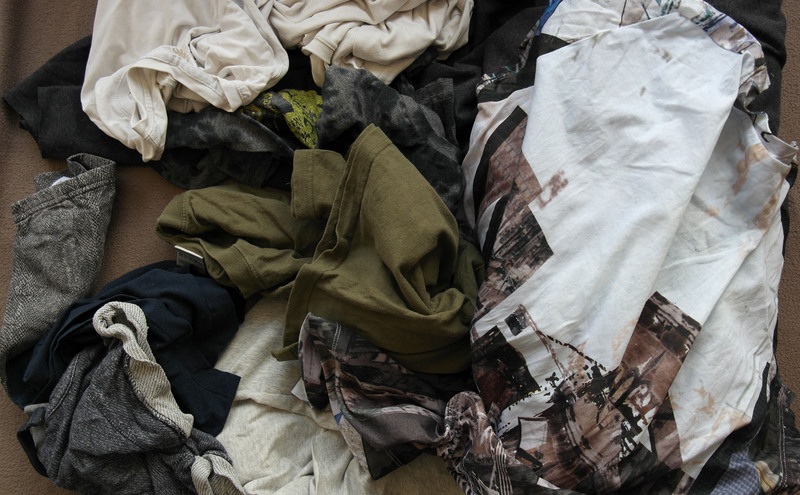 There is a t-shirt in this heap that I have made before from printed fabric that I never wear. This will be the most important fabric part of the dress, because I also designed the print in a tedious 3D process. I chose the rest of the colours/garments around this T-shirt. It is combined with a t shirt form one of my kids that has a print that has half disappeared because of the laundry(or rubbish print-technique, whatever you like). 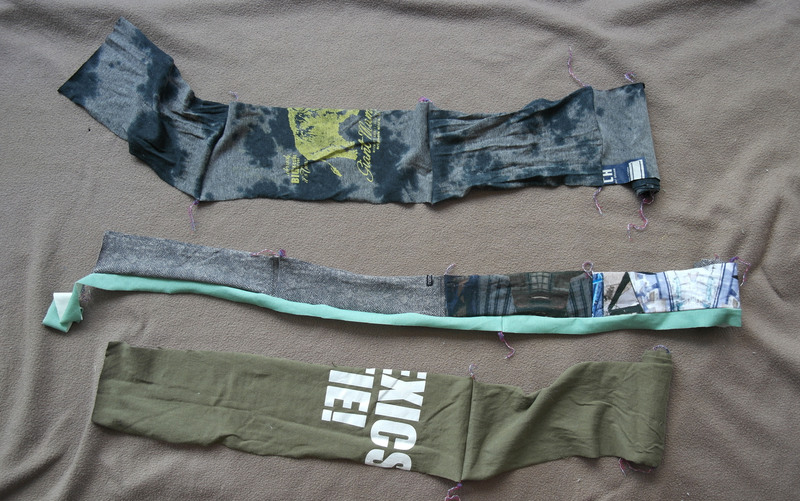 A baby-legging and some not-so-white-anymore t-shirts that I will turn into the lower layer of the top in order to save on meters of new organic fabric that I need to use. Another t-shirt with some text that I like to cut through because I think that it will give an interesting effect. So, after the cutting and the first bit of sewing the front panel the following picture is what you get. The top layer is already stitched together and will go over the ugly white nursing panel. This nursing panel I will take out and replace by a normal panel as soon as I have finished breastfeeding. My stitching is wide all around this panel, to make sure I can take it out really relatively easily. Like I said, everything happens at the top! Now I am going to make the main part of the dress. From a design point of view I also want some cut-n-sew in the dress, not only in the top part. Furthermore I would want to save as much as I can from the new organic fabric that I use. Therefore I made a few straps of fabric from the old garments. The width depends on the original garment as well as the length of the dress. These big “ribbons” will be put into the fabric to create the front and the back of the fabric. Posted on July 11, 2018 by Marjolein. This entry was posted in upcycle. Bookmark the permalink.